Transit agencies should once again become urban developers. When parts of their freeway network were damaged by the recent earthquake, many Los Angelenos were forced to “take to the streets”-to drive on the numerous arterials and transit corridors that interlace the city. They discovered a forgotten commercial landscape of small retail establishments mixed with office and residential buildings, automobile dealerships, junkyards, parking lots, and vacant space. These corridors are not unique. They are typical urban landscapes that can be found in virtually all American cities. Prior to the construction of freeways they were the principal traffic and transit arteries of the city, and they still carry the largest share of transit traffic. Urban arterial corridors are the “in-between” spaces of the city. 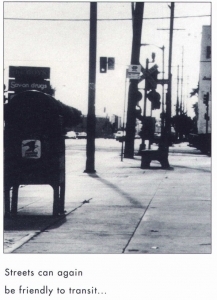 They connect centers with subcenters, and the latter with one another, in the multicentered urban expanse that is typical of the post-industrial American city. But these transit corridors have become unfriendly to transit riders. Many believe that commercial corridors are products of automobiles. Although the automobile has had dramatic effects on city form, actually the horsecar and later the electric streetcar generated the corridors. The evolution of commercial corridors traces back to the middle of the nineteenth century, when most American cities started to expand rapidly beyond the limits of downtown. 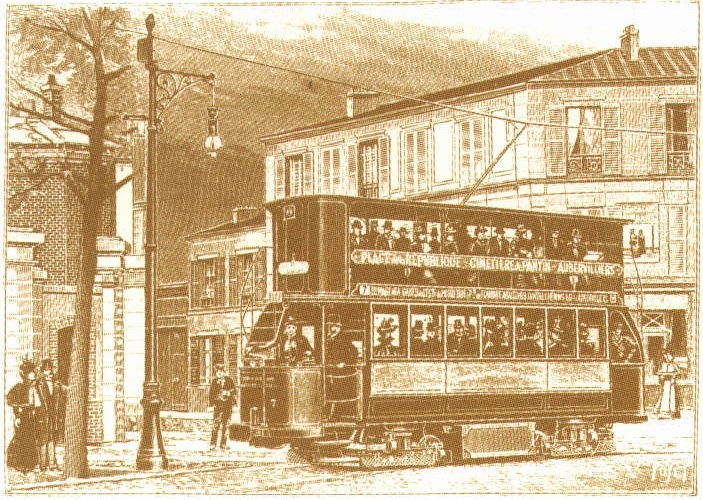 Many years before the automobile, alert speculators were erecting commercial buildings along streetcar lines. These commercial establishments served the households that settled along the lines, sparing residents from having to go all the way downtown to shop. Initially a few stores, churches, and sometimes schools were built to serve the residents. 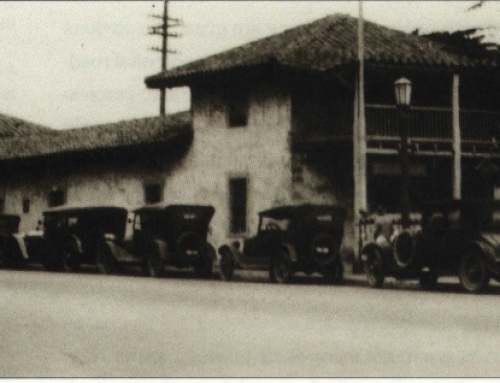 These first commercial establishments outside downtown were modest, consisting of a single row of shop fronts. They were seen as interim improvements, designed to produce enough revenue to pay the taxes and hold the property for more intense development in the future. Hence, these buildings were also referred to as “taxpayers,” and the commercial corridors they fronted were called “taxpayer strips.” A linear, centerless shopping district – the commercial strip – was evolving. For businesses, taxpayer strips offered an ideal solution. Rents were lower than downtown, yet many people lived close by. Customers could walk, or even take the electric car to the shops. Strips were less congested than downtown and allowed for more parking near the stores. As the primary access routes that connected downtown to the outlying residential districts, the strips quickly became important and vibrant places for commercial, recreational, and residential activities. Taxpayer strips could be found all over the country. They were loosely lined with single-story retail stores and occasional supermarkets, movie houses, and two-story commercial buildings. 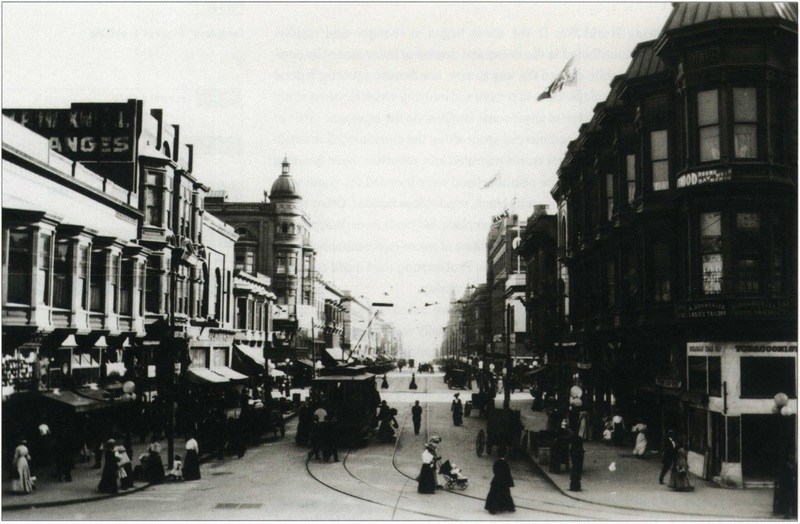 They combined both car- and pedestrian-oriented functions (drugstores, groceries, small shops). 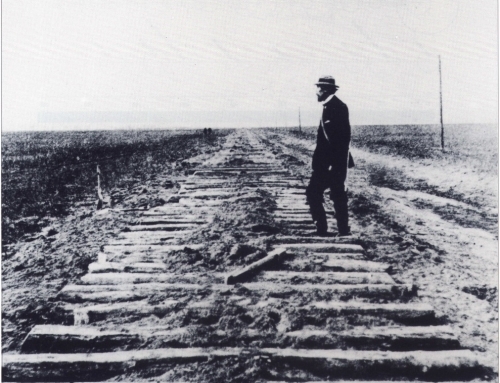 Parts of these strips were eventually widened and extended, and these improvements set the stage for strip commercialization and the complete dominance of the automobile. Soon commercial corridors became lined with gas stations, hot dog stands, motels, shopping centers, and drive-in theaters. As competition increased, merchants looked for new ways to lure their prospective clients. Each sign and building had to visually shout “slow down, pull in, and buy!” Thus, the architecture of the strip became the direct expression of its commercial function. Rules along the strip were usually less strict than those downtown or in older, denser, commercial zones. Keenly aware that trade would be lost if they could not capture the attention of motorists passing by, merchants tried to blend building and sign, architecture and advertising. 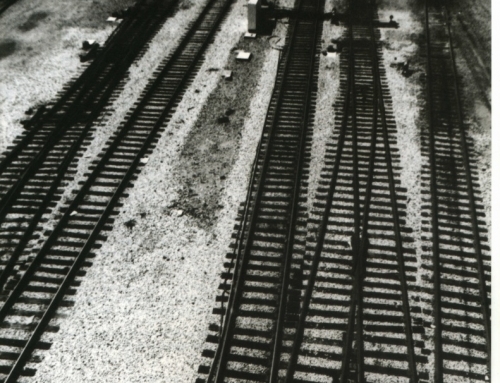 Immediately following World War II, the scene began to change – and rapidly. Increased suburbanization contributed to the decay and demise of many inner-city commercial corridors. The automobile opened the way to new, low density suburbs; federal policies blessed the move of the middle class to remote and outlying areas. Housing along and behind the corridors filtered down to low-income families. As the economic crisis of the inner city deepened, demand for commercial space along the corridors fell dramatically. Posh shops, banks, and department stores migrated into suburban malls. Starting in the 1960s many small shops serving the neighborhood were boarded up. Some were replaced by long, warehouse-type buildings with blank, windowless facades. Other shops were simply razed, fenced empty lots appearing in their place. Sidewalk trees disappeared, parking lots multiplied, and corridors became collections of micro-environments, a visual hodgepodge of unrelated and often ugly buildings. Proliferating mini-malls at corner lots during the 1980s did nothing to enhance economic vitality. In the 1990s many inner-city commercial corridors are but skeletons of their formerly prosperous selves. The overabundance of commercially zoned property in combination with economic recession and disinvestment has contributed to high rates of vacancy. Planning policy has ignored or neglected the corridor environment. Without adequate public funds, the public realm has deteriorated. Our survey of three Los Angeles corridors found them suffering from neglect, lack of upkeep, economic disinvestment. Many corridors now lack basic pedestrian amenities, benches and bus shelters are nonexistent, debris clutters the narrow sidewalks. 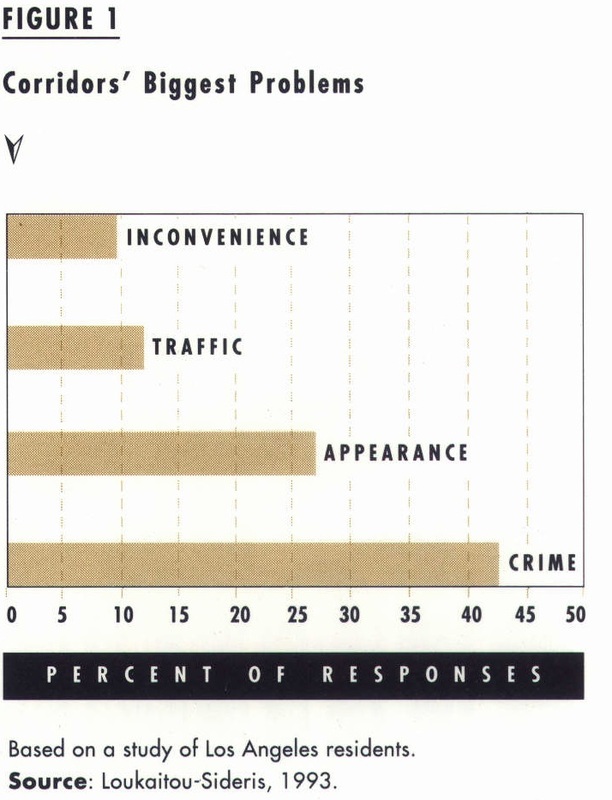 Residents complain bitterly about their crime and ugliness (Figure 1) and desire a range of improvements (Figure 2). These streets are unfriendly to transit, being devoid of pedestrian life, landscaping, and street furniture. However, they are still the primary transit routes in the city. Hundreds of miles of bus transit are in operation connecting the inner city with outlying employment centers. Hundreds of thousands of people depend every day on a bleak, often hostile corridor environment for transportation services. Up to one-third of our survey respondents do not own a car. In addition to these captive riders, the survey revealed that the majority of car owners say they would use public transit if the bus system were more reliable, clean, and safe and if the public environment (bus stops, sidewalks, streets) were more amiable. Transit agencies seek to expand their markets by lowering fares, improving frequency and reliability of service, offering more comfortable and faster buses, relieving overcrowding through proper scheduling, protecting passenger safety when in the bus, and supplying better information on schedules and routes. These are all rational measures, but they ignore an important factor. Unlike travel by private automobile that does not require one to set foot on public grounds, transit travel involves considerable exposure to the public realm. The environment’s condition and a person’s perception of it the quality of the street, the sidewalk, and the bus stop-become as important as the reliability, -frequency, and affordability of the transit service. People with the option to choose will not be lured by a transit system that exposes them to unacceptable levels of discomfort and risk. Yet, waiting at the bus stop is uncomfortable and often unsafe. The public environment is hostile to pedestrians. Many people avoid the bus, if they can. Streets will again be friendly to transit only if they become friendly to pedestrians. So, the physical and economic retrofit of corridors should be high on transit agencies’ agendas and an inseparable part of transit policy. The high level of transit use along corridors, the potential for even higher use because of the corridors’ strategic locations between employment centers, and that corridors’ current underdevelopment that allows for infill and densification, all provide good reasons for promoting pedestrian-oriented improvements and economic rejuvenation. Reconverting urban arterial corridors to pedestrian use poses quite a challenge. The corridors’ basic structure is long and linear, while pedestrians want concentrated and concentrically patterned activities that expand the frequency of shopping opportunities per walking distance. Sidewalks are now interrupted by numerous driveways and parking lots; buildings are often set back from the streets; many building facades are blank; automobile-oriented activities predominate. Still, physical improvements are easier to tackle than economic ones. A rich literature on pedestrian behavior finds that the presence of absence of certain physical/environmental factors can support or inhibit pedestrian activity and, hence transit use. Variables that encourage or deter pedestrian activity include: density, type and mix of land uses, pedestrian/automobile interaction, configuration and condition of the streetscape, convenience, comfort, and security. Economic strategies are more evasive but crucial to recapturing the vitality that once characterized corridors. It is quite clear that unless development recurs and businesses, housing, and services return fill the holes in the corridors, the environment will continue to deteriorate. Inner-city revitalization has been a goal of federal and local governments for decades, but the results of urban renewal did not leave room for hope. Subsequent antipoverty programs did not bring tangible benefits for inner-city residents. So is there any hope now for these streets that form the backbone of the American inner city and its public transit service? Who can plant the seeds for their revival? For one the federal government has again decided to invest money in the inner cities. It has passed legislation to establish nine federal “empowerment zones” and ninety-five “enterprise communities” in depressed urban and rural areas of the country. Critics are skeptical about the outcomes of this policy, mainly because past efforts with enterprise zones at the state level have not produced major benefits. However, the existence and proliferation of community development corporations (CDSs) in many inner-city neighborhoods raise signs of hope. These are nonprofit, community-based groups consisting of neighborhood residents and local business owners who are dedicated to revitalizing their neighborhoods. They want to enter into partnerships with the federal government and philanthropic foundations to achieve neighborhood-based physical and economic improvement. But even though self-help and community initiative are essential elements of community development, redevelopment is unlikely to occur without serious support from local government and concerted efforts by local agencies-including transit agencies. 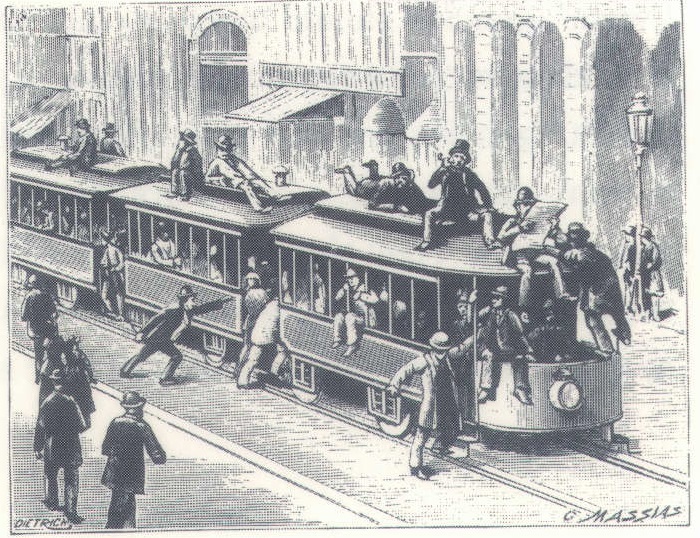 In the early days of the streetcar, transit entrepreneurs were among the most powerful urban developers. They built large suburban projects with integral transit lines that made their new houses accessible to downtown and hence salable. These developers understood that environmental quality and volume of transit patronage go together, that each determines and depends upon the other. Today, when most transit systems are owned by governments, they’ve been turned into specialized agencies, concerned exclusively with running their buses or trains. But our current experience with everdeclining transit patronage suggests that’s no longer enough. Transit agencies now need to play a larger role, a role reminiscent of that played by the transit barons of yesteryear. Because their hundreds of bus lines along these deteriorated corridors are typically running in the red, their self-interest calls for them to rejuvenate their own business by helping to rejuvenate the corridors. 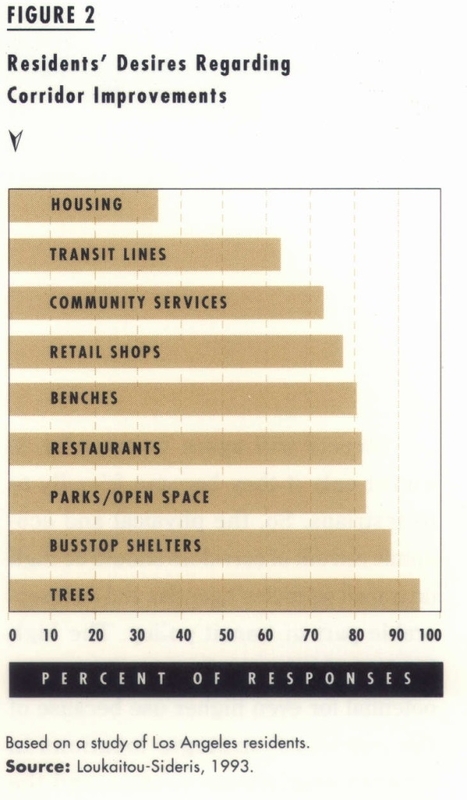 I suggest that transit agencies should again go into the land-development business. Bus operators should pursue joint-venture development projects next to transit stops, just as some rapid-transit agencies are now promoting commercial and residential development around subway stations. Bus operators should provide street furniture-benches, kiosks, bus shelters. They should cooperate with municipal and other agencies in beautifying transit streets-replacing lost trees, repaving sidewalks, and encouraging new pedestrian-oriented businesses and related civic activities. Consider the prospect for “transit enterprise corridors.” With the blessing of city council, selected derelict locations might be turned into active development sites, triggered by development incentives to private entrepreneurs and modem transit entrepreneurs – tax breaks for investors, access to credit on favorable terms, judicious use of eminent domain, rezoning to permit mixed land use with fewer restrictions, reduced parking requirements, inducements to nonprofits and CDCs to build affordable housing along transit corridors. Consider what might happen if transit agencies were again to become development agencies. If currently bleak transit corridors were reconverted into attractive places to live, walk, and shop, perhaps many more people would then patronize the transit lines. After all, it was transit that initially defined these corridors, then made them into prosperous business districts where civic activities were once dynamic and rich. If transit’s declining patronage does in part reflect the decline of the corridors, then one way to attract more riders is to make those corridors attractive again. Transit agencies should look back to their predecessors and once again become urban developers, using public transit and corridor revival as mutually reinforcing instruments. 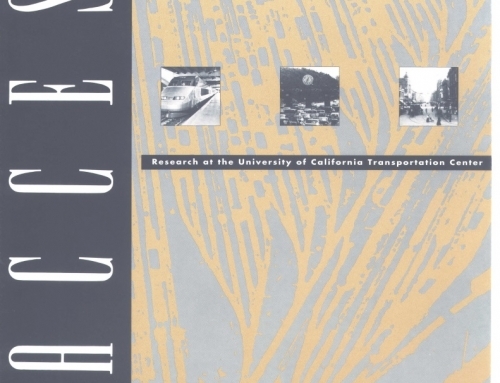 Barton Ashman Associates, Inner City Transit Needs (report prepared for the Los Angeles Metropolitan Transit Authority, 1993). 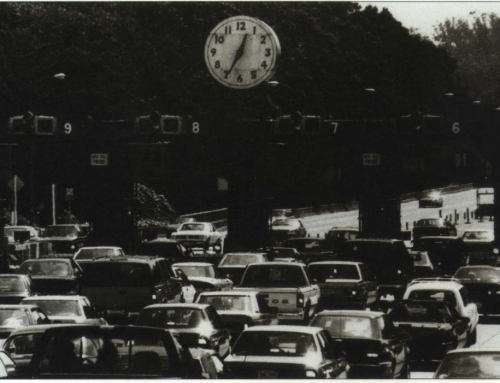 J. Fruin, Pedestrian Planning and Design (Mobile: Elevated World, Inc., 1987). C.H. Liebs, Mainstreet to Miracle Mile: American Roadside Architecture (Boston: Little, Brown and Company, 198S). A . Loukaitou-Sideris, “Retrofit of Urban Corridors: Land Use Policies and Design Guidelines for Transit-Friendly Environments.” 1993. UCTC No. 180. M . Southworth and K. Lynch, Designing and Managing the Strip (Cambridge: Harvard-MIT Joint Center for Urban Studies, 1974). 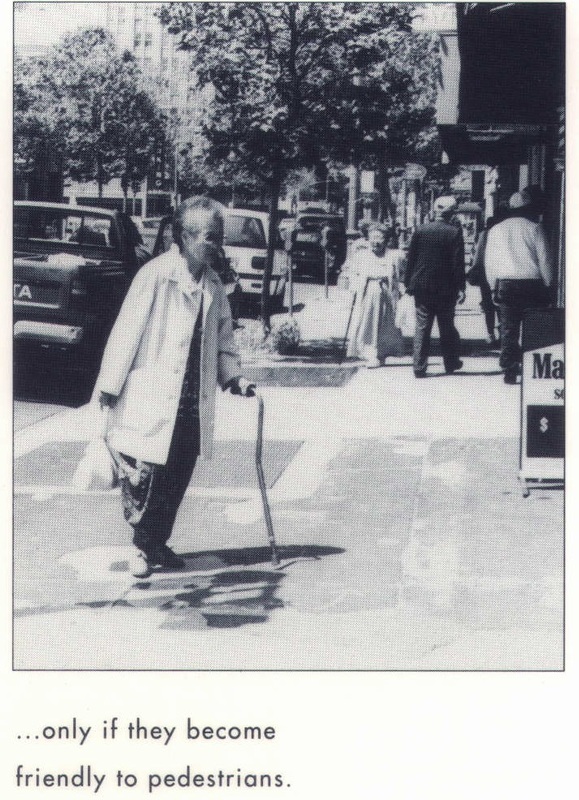 R. Untermann, Accommodating the Pedestrian (New York: Van Nostrand Reinhold, 1984). A . Vernez-Moudin, ed., Public Streets for Public Use (New York: Columbia University Press, 1987) .